Ketef Hinnom (Hebrew: כֵּתֵף הִינוֹם katef hinom, "shoulder of Hinnom") is an archaeological site southwest of the Old City of Jerusalem, adjacent to St. Andrew's Church, now on the grounds of the Menachem Begin Heritage Center. It is located where the Valley of Rephaim and the Valley of Hinnom meet, on the old road from Jerusalem to Bethlehem. The site consists of a series of rock-hewn burial chambers based on natural caverns. 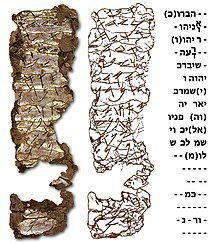 In 1979, two tiny silver scrolls, inscribed with portions of the well-known Priestly Blessing from the Book of Numbers and apparently once used as amulets, were found in one of the burial chambers. The delicate process of unrolling the scrolls while developing a method that would prevent them from disintegrating took three years. They contain what may be the oldest surviving texts from the Hebrew Bible, dating from the First Temple period around the late 7th to early 6th century BCE prior to the Babylonian Exile, and are now preserved at the Israel Museum. The scrolls were found in 1979 in Chamber 25 of Cave 24 at Ketef Hinnom, during excavations conducted by a team under the supervision of Gabriel Barkay, who was then professor of archaeology at Tel Aviv University. The site appeared to be archaeologically sterile (the tomb had last been used for storing rifles during the Ottoman period), but a chance discovery by a 13-year-old "assistant" revealed that a partial collapse of the ceiling long ago had preserved the contents of Chamber 25. A reconstruction indicates that there were five chambers and a central 'hall' in cave 24. The cave could hold about 22+ bodies on benches, each with a headrest of stone. Under three of the chambers in the cave there were repositories. The repositories were used for secondary burial, which means that the bones and other remains of the long deceased body were removed and put into the repository, thus making space for another body on that particular bench. The chambers were neatly cut with smoothed surfaces using the royal cubit as measure. The repositories, such as that under chamber 25, had rough surfaces and a sack-like form, thus it was not intended to be seen. Ketef Hinnom cave 24 has a similar outline and capacity as the Mamilla cave complex 1 and 2, however, these cave complexes have more rooms than cave 24 at Ketef Hinnom. To accommodate more people Ketef Hinnom cave 24 has used the large chamber to the right to accommodate about 10 people, whereas this room in the Mamilla cave complexes did not have benches, thus probably they were used for chemical treatment of the bodies. The repository under chamber 25 contained approximately 60 cm of material with over a thousand objects: many small pottery vessels, artifacts of iron and bronze (including arrowheads), needles and pins, bone and ivory objects, glass bottles, and jewelry including earrings of gold and silver. In addition, the excavators found two tiny silver scrolls, referred to below as KH1 and KH2. The tomb had evidently been in use for several generations from about 650 BCE, that is towards the end of the First Temple period, and it continued to be used after the destruction of Jerusalem in 587/6 BCE. KH1 was found in Square D, the middle of the repository, 7 cm above the floor, while KH2 was found while sifting dirt from the lower half of the deposits in Square A, the innermost portion of the repository. Both amulets were separated from Hellenistic artifacts by 3 meters of length and 25 cm of depth, and embedded in pottery and other material from the 7th/6th centuries BCE. Barkay initially dated the inscriptions to the late-7th/early-6th centuries BCE, but later revised this date downward to the early 6th century on paleographic grounds (the forms of the delicately incised paleo-Hebrew lettering) and on the evidence of the pottery found in the immediate vicinity. This dating was subsequently questioned by Johannes Renz and Wolfgang Rollig, who argued that the script was in too poor a condition to be dated with certainty and that a 3rd/2nd century BCE provenance could not be excluded, especially as the repository, which had been used as a kind of "rubbish bin" for the burial chamber over many centuries, also contained material from the fourth century BCE. A major re-examination of the scrolls was therefore undertaken by the University of Southern California's West Semitic Research Project, using advanced photographic and computer enhancement techniques which enabled the script to be read more easily and the paleography to be dated more confidently. The results confirmed a date immediately prior to the destruction of Jerusalem by the Babylonians in 586/7 BCE. Kyle McCarter of Johns Hopkins University, a specialist in ancient Semitic scripts, has said the study should "settle any controversy over [the date of] these inscriptions". The 2004 team described the scrolls as "one of most significant discoveries ever made" for biblical studies. Apart from their significance for our knowledge of the development of the Hebrew alphabet, the scrolls "preserve the earliest known citations of texts also found in the Hebrew Bible and ... the earliest examples of confessional statements concerning Yahweh." The reference to Yahweh as "Rebuker of Evil," found in later incantations and amulets associated with Israel, is evidence that these artifacts were also amulets. Based on our new analysis and reading of these texts, we can reaffirm with confidence that the late preexilic period is the proper chronological context for the artifacts. We can further reassert the conclusion reached by most scholars: that the inscriptions found on these plaques preserve the earliest known citations of texts also found in the Hebrew Bible and that they provide us with the earliest examples of confessional statements concerning Yahweh. The scrolls are known as KH1 and KH2. They are written in Paleo-Hebrew characters (see Paleo-Hebrew alphabet) not the Aramaic square script more familiar to most modern readers. Text below in square brackets represents informed deduction. The omission of "thousands" may have originally appeared on line 7 as in Deuteronomy 7:9. 6:26 Yahweh lift up his countenance upon you, and give you peace. (Note that the two bold italicized phrases above are not present on this scroll; also note that all of Numbers 6:25–26 may have appeared on KH1 after line 18 where the scroll has disintegrated). "The utterance of YHWH are pure utterances, silver refined in a furnace in the earth, purified seven times. You O YHWH, will guard them; you will protect him from this generation forever. On every side the wicked prowl, a vileness is exalted among humankind." The possibility of an extended parallel between Deut. 7:9 and Amulet 1 suggests literary dependence between these two texts. Deut. 7:9 is commonly regarded as Decalogue interpretation (Exod. 20:6, Deut. 5:10). Granted a literary link between the amulet and Deut. 7:9, the direction of influence might be suggested as follows: 1) Exod. 20:6, 2) Deut. 5:10, 3) Deut. 7:9, 4) Ketef Hinnom amulet 1. ^ Barkay, G., A.G. Vaughn, M.J. Lundberg and B. Zuckerman, "The Amulets from Ketef Hinnom: A New Edition and Evaluation," Bulletin of the American Schools of Oriental Research 334 (2004): 41-71. (An innovation in the report was the simultaneous publication of an accompanying "digital article," a CD version of the article and the images). 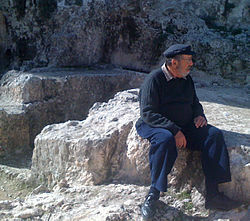 ^ Menachem Begin Heritage Center, Lookout and Reich Archaeological Garden. ^ A photographic view of the site, showing the entrance to the tombs, is available at this link. ^ Barkay, Gabriel, et al., "The Challenges of Ketef Hinnom: Using Advanced Technologies to Recover the Earliest Biblical Texts and their Context," Near Eastern Archaeology, 66/4 (2003): 162–171. The article includes an isometric drawing of the chamber where the find was made. ^ "Pilgrimage Panorama" – Barkay's account of the finding of the scrolls. ^ See article Secondary burial. ^ Renz, Johannes and Wolfgang Röllig, Handbuch der althebräischen Epigraphik (Darmstadt: Wissenschaftliche Buchgesellschaft, 1995). ^ Barkay, G., A.G. Vaughn, M.J. Lundberg and B. Zuckerman, "The Amulets from Ketef Hinnom: A New Edition and Evaluation," Bulletin of the American Schools of Oriental Research 334 (2004): 41–71. (An innovation in the report was the simultaneous publication of an accompanying "digital article," a CD version of the article and the images). ^ a b c "Solving a Riddle Written in Silver", New York Times, 2004. ^ Barkay, Gabriel, et al., "The Challenges of Ketef Hinnom: Using Advanced Technologies to Recover the Earliest Biblical Texts and their Context", Near Eastern Archaeology, 66/4 (Dec. 2003): 162-171. ^ Davila, James, "MORE ON THE KETEF HINNOM AMULETS in Ha'aretz," Paleojudaica, Sept. 2004. ^ Smoak, Jeremy, "Amuletic Inscriptions and the Background of YHWH as Guardian and Protector in Psalm 12," Vetus Testamentum 60 (2010): 427–428. ^ Waaler, Erik, "A reconstruction of Ketef Hinnom I," MAARAV 16/2 (2009): 261. Barkay, Gabriel (1983). "News From the Field: The Divine Name Found in Jerusalem". Biblical Archaeology Review. 9:2 (March/April): 14–9. Barkay, Gabriel (2009). "The Riches of Ketef Hinnom: Jerusalem tomb yields Biblical text four centuries older than Dead Sea Scrolls". Biblical Archaeology Review. 35:4 (Jul/Aug Sep/Oct). Barkay, Gabriel; Lundberg, Marilyn J.; Vaughn, Andrew G.; Zuckerman, Bruce; Zuckerman, Kenneth (2003). "The Challenges of Ketef Hinnom: Using Advanced Technologies to Reclaim the Earliest Biblical Texts and Their Contexts". Near Eastern Archaeology. 66:4 (December): 162–71. Barkay, Gabriel; Lundberg, Marilyn J.; Vaughn, Andrew G.; Zuckerman, Bruce (2004). "The Amulets from Ketef Hinnom: A New Edition and Evaluation". Bulletin of the American Schools of Oriental Research. 334 (May): 41–70. Berlejung, Angelika (January 2008). "Ein Programm fürs Leben. Theologisches Wort und anthropologischer Ort der Silberamulette von Ketef Hinnom". Zeitschrift für Alttestamentliche Wissenschaft (in German). 120 (2): 204–230. doi:10.1515/zaw.2008.013. Smoak, Jeremy (2010). "Amuletic Inscriptions and the Background of YHWH as Guardian and Protector in Psalm 12". Vetus Testamentum. 60 (3): 421–432. doi:10.1163/156853310x504856. Smoak, Jeremy (2011). "'Prayers and Petition' in the Psalms and West Semitic Inscribed Amulets: Efficacious Words in metal and Prayers for Protection in Biblical Literature". Journal of the Study of the Old Testament. 36 (1): 75–92. doi:10.1177/0309089211419419. Smoak, Jeremy D. (2015). The Priestly Blessing in Inscription & Scripture: The Early History of Numbers 6:24-26. Oxford: Oxford University Press. ISBN 978-0-19-939997-0. Waaler, Erik (2002). "A revised date for Pentateuchal texts? Evidence from Ketef Hinnom" (PDF). Tyndale Bulletin. 53 (1): 29–55. Archived from the original (PDF) on 2011-07-16. Waaler, Erik (2011). "A Reconstruction of Ketef Hinnom I". Maarav. 16 (2): 225–263. Yardeni, Ada (1991). "Remarks on the Priestly Blessing on Two Ancient Amulets from Jerusalem". Vetus Testamentum. 41 (2, fasc. 2): 176–185. doi:10.1163/156853391X00450. Wikimedia Commons has media related to Ketef Hinnom. "Jerusalem — Silver Plaques" – brief overview at Jewish Virtual Library, sourced from the Islraeli Foreign Ministry. "The Riches of Ketef Hinnom" – Biblical Archaeology Review online article. 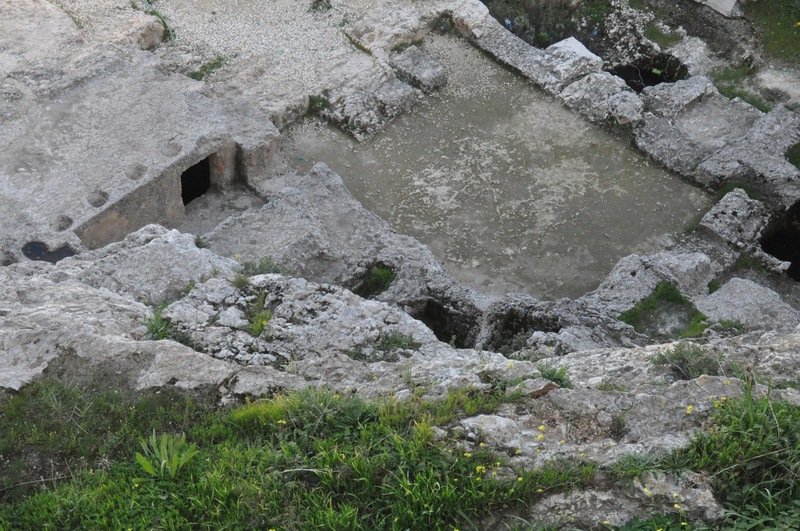 The Ketef Hinnom tombs – photos provided by Holy Land Photos. "St. Andrew's Scottish Church" – photos and details of KH's location relative to the church. This page was last edited on 17 April 2019, at 08:13 (UTC).